Home » Health » Do E-Cigs Actually Help You Stop Smoking? In previous articles, we have looked into the health benefits of smoking an e-cig rather than a cigarette. E-cigs contain approximately four ingredients in most cases. E-cigs usually contain vegetable glycerin, propylene glycol, nicotine, flavoring, and distilled water. Cigarette smoke contains over 4,000 chemicals, including 43 known for causing cancer. Cigarette smoke also has over 400 toxins found in one cigarette, and smoking just one can take up to five minutes off your life. Although it might seem like an e-cig is the better alternative, solely based on the chemicals found in each, this does not mean that an e-cig will help you stop smoking. Both cigarettes and e-cigs contain nicotine – the chief active constituent of tobacco. This is the stuff that helps create the tobacco buzz that makes people get addicted to smoking. Nicotine is as difficult to give up as heroin and the side effects can affect your heart hormones and gastrointestinal system. With over one billion tobacco smokers all hooked on nicotine, it isn’t surprising that the addiction is so hard to give up. Nicotine addictions are hard to deal with. Smokers trying to quit, who switch to an alternative that still has nicotine, isn’t a safe bet to stop quitting. This study found more than 90 percent of smokers who also vaped was still smoking a year after the study began. 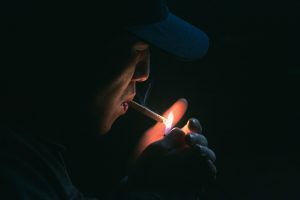 About 54 percent of these dual wielders were still vaping, and 37 percent were still using cigarettes and stopped using e-cigarettes or other vaping devices. If you need help battling addictions, it might be good to reach out to professionals. They can help form a system to help you as much as possible conquer your bad habit. You can always call the addiction helpline at 877-804-7989. You can also visit https://www.samhsa.gov/find-help/national-helpline for more help to combat your addiction.